We transform economies and improve lives. 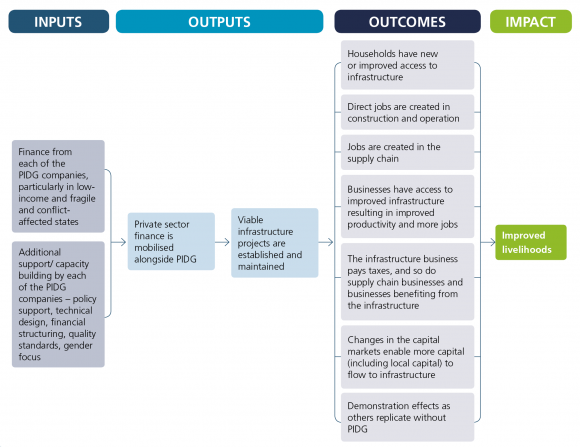 Through the application of our theory of change, as illustrated below, we mobilise private sector funding, leveraging public sector funding, and blending it with private sector investment (PSI) from local, regional, international sources, and debt or equity from Development Finance Institutions (DFIs) to achieve greater impact and to change lives. Finance from PIDG companies, particularly in the poorest and most fragile states, combined with additional support and capacity building in the form of financial structuring, design, quality standards, policy support and a focus on gender, is invested in infrastructure companies alongside private sector funds. These infrastructure companies are commercially viable, either immediately or over time, and generate positive outcomes for individuals by providing new or improved access for households to energy, water, communications or transport solutions. The outcomes for women and girls are of particular interest. In order to achieve impact, these infrastructure services must be affordable to households. They may achieve a scale of impact either through their size or through their replication. Alternatively, or additionally, these companies provide new or improved access to infrastructure for businesses which may then become more productive and employ more people. In order to achieve impact in this way, these services must be affordable to businesses. There may also be employment opportunities generated in the supply chain of the PIDG-supported infrastructure with a keen focus on gender equality, employment opportunities for women and girls being of particular interest. The infrastructure company will pay taxes, as will the companies in the supply chain and the companies benefiting from the infrastructure. PIDG’s investments may also have an influence on the wider capital market, enabling more funds to flow to infrastructure in the future. This has the potential to create a scale-up of activities, leading to transformation in the market. PIDG’s investments may also demonstrate the viability of a structure (for example, a public private partnership), a technology or a geography, so that other investors are attracted into that market and engage without the need for PIDG’s involvement. This replication can lead to further scale and transformation. This approach works. Since 2002, we have successfully leveraged our funding: $33.7bn has been invested by private sector investors and development finance institutions alongside PIDG’s $3.2bn commitment to infrastructure projects; and for each $1 of PIDG member funding, projects we have supported have mobilised $23, of which $17 comes from the private sector. During this time, we have delivered high development impact across 170 projects, creating more than 240,000 long-term jobs and providing 231 million people with access to new or improved infrastructure.